Shopping in the city of San Fernando is really worthwhile The prices of clothing, shoes, children’s clothing, travel goods like suitcases are much cheaper than the nearby Playa del Ingles and Maspalomas shops. The difference you notice very quickly if you order something in a local bar or snack bar. Shopping centers in San Fernando are CC Bellavista, CC Botánico, CC Euro Center, C.C Nilo, CC Ronda, Hiperdino and CC San Fernando. Please note that the shops in San Fernando are closed on Sundays. Just as each year also be celebrated the New Year celebrations in San Fernando. Do you live in San Fernando or are you on holiday in Gran Canaria to hibernate, then a day trip sure to consider during the Christmas period. Around Christmas and New Year’s Eve thanks to the warm temperatures are many activities outdoors in the municipality. A white Christmas you will not find here, but fun and joy is abundant. Between the shopping and residential neighborhood lies this eponymous park Bellavista . The modern urban green park has a total area of 18 000 square meters. 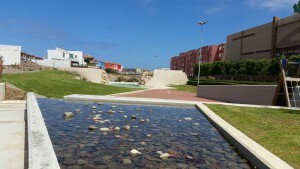 Throughout the park runs a canal that channels water from the mountains to the coast of Maspalomas. From about the middle of the park there are small channels with rippling water flows into an old water tank. During very hot days it is lovely here to stay among the numerous trees. A fountain is illuminated in the evening and a water spring giving the park an extra dimension. For sports lovers, there is a practice field for football training and an outdoor circuit with fitness equipment, jogging and gymnastics. Naturally for the children are provided some toys. A walk through this pleasant park with its winding pathways is highly recommended. Every week there is on Wednesday and Saturday a public market. All tourists come together on this market. The animated and noisy market at the Mercado Municipal receive weekly hordes of tourists. Outside the market vendors selling handbags, clothing, jewelry, shoes, everything at bargain prices, at least you should not forget to ask for a good price. The sellers dare start with a price that is too expensive, a lower price offer is the message. Outside the market hall you can enjoy a terrace with drinks and snacks Here and there are also stands with freshly squeezed juice of papaya, orange, citrus. Inside the market hall is all to obtain what food and flowers are concerned. Fresh produce, fruit, vegetables, fish, everything is freshly available here. Flowers and plants typical Canarian products can be found in the market hall. Be sure not to forget the “Queso de Flor de Guia“., a specialty of Guia, Moya and Galdar. Queso de Florword made of cow and sheep milk. It is a full-fat cheese with a slightly bitter taste. The market can most easily reached by public transport or taxi. There is during the market days a special bus (Mercado) which takes you directly to the market. By taxi is no problem, the taxis running back and forth. The market is between 08:00 and 14:00 on Wednesdays and Saturdays. Check for the correct route, the map on the right in the sidebar or click here. San Fernando is not merely to do some shopping. It has also a history. Take the “Casa Condal de San Fernando”. The two-storey house has been better known by the inhabitants of the city as “La Casa de Doña Candelaria“, one of the two heirs of the county of Vega Grande. The house was never inhabited, only when the family came to visit Maspalomas. The building dates from the 18th century, and has undergone various interventions until the twentieth century. Pass in 1985 is Casa Condal be declared a national historic monument.Today it is used as an exhibition room. You can visit Casa Condal or La Galeria in Calle Martial Franco 7-9 in San Fernando. 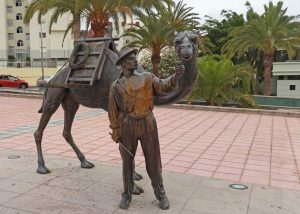 At the roundabout near the Avenida de Tejeda you perceive a sculpture of a camel and camel driver. This beautiful sculpture is a tribute to one of the oldest traditions in history and culture for the development of the economy of Gran Canaria and San Fernando.